Nintendo is the last among the big 3 to have their presser. Last, but definitely highly anticipated. Cafe? Wii 2? Beem? Or perhaps just 'Nintendo'? Keep refreshing to find out! Live-blogging starts at 12mn (GMT+8). Starts in 1 hour 10 minutes. Hope they keep out the boring stuff! Will be 5 minutes late. Ninty fanboi in me getting hyped up! Starts off with Zelda medley played by a live orchestra. Zelda 25th Anniversary project? Miyamoto on stage. OK, this anniversary celebration will be quite huge. A Zelda game for every current Nintendo console. Link's Awakening for... Virtual Console? Didn't really catch that. Typing and watching and listening is hard... Ocarina of Time for 3DS will be out next week. Four swords downloadable game will be free (DSi-ware)! Skyward Sword release worldwide this Holiday, for Wii. Legend of Zelda concert around the world! "In each region". Singapore will probably be bundled in the general "Asia" region =( A bunch of music CDs for Zelda music will be released too. Nintendo probably has the classiest presser this year. Full orchestra playing accompanying music for every segment. Satoru Iwata on stage. New console reveal?? Quick quick, don't tease! Damn it. He really did mean to just tease us for now. Full reveal later on. He continues to talk about CURRENT consoles. And 3D. A trailer teasing the following games in 3D: Mario Kart, Star Fox, Mario Brothers, Kid Icarus, Luigi Mansion. Regginator takes the stage! Shows off a couple of 3DS games. Mario Kart (Holiday 2011), sadly, doesn't even look that good. The graphics look like it came directly from the DS, except with a few extra effects. Can't they do slightly higher-res textures? Star Fox 64 3D, September 2011. Finally, an actual Mario game for 3DS (Super Mario 3D), coming out by end of 2011. Luigi, the "first brother of video games", will be back in Luigi's Mansion 2. Brand new game for 3DS. No release date. Now talking about 3DS store, Browser, free ExciteBike and Pokedex 3D. All announced before already. WiiU (pronounced We You). Photo of controller up soon. Speechless. Video streamed to the controller so you can play games without using your TV. Can also use it to augment the game as a 2nd screen. Mounted on the Wii Zapper as a "scope". Playing a small board game on it. Transferring a video from the controller to the TV to share with your friends and family. You have to watch the video to understand. Nintendo did an amazing job of presenting it. Smash Brothers for both 3DS and WiiU! Lots of cheering from the audience. The game will work together in some fashion. Amazingly, Nintendo has some WiiU software to show off at the booths. Interactive demos. Audible gasp as everyone marvels at the graphical capabilities of the WiiU. This bird demo looks amazingly detailed! 4 prototypes to play on the show floor: Super Mario Brothers Mii. Some kind of AR game. ChaseMii, a catching game? Lastly, a shooter. First actual WiiU game? Lego City Stories. Open World Action Game. Also coming to 3DS. The map looks like it's from GTA 4. Darksiders 2 at launch. Batman Arkham City. (One other game that I missed). Assassins Creed. Ghost Recon Online. Wow. Great promises, but they did this for the 3DS too. Am I watching the Sony E3 conference or something? A bunch of demo reels of various games on show now, all looks to be in HD. PS3/360 graphics. Metro Last Light looks INCREDIBLE, better than some current gen games. Ninja Gaiden 3! Wow. Nintendo showing off huge amounts of blood and gore there. Lots of cheers from the audience. Definitely a surprise! And so he starts to talk about EA Sports. But there's Battlefield 3 too! Images of various EA games appear briefly on screen, including The Sims. Does not necessarily mean they will release those games on WiiU. Reggie is back on stage. Seems to be wrapping things up. 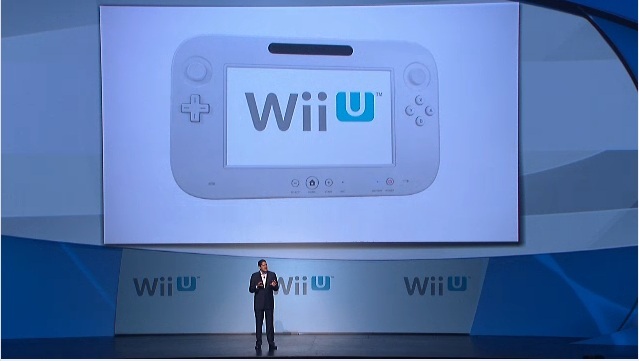 The Press will get to play WiiU in a few minutes. It's over! Definitely the least boring conference this year. Well-paced and impressive presentation. They understood the importance of letting people try it out instead of just talking about it. People getting out of the hall to play the WiiU to lots of loud cheering.